Hi iCopic friends! It's Alyssa here with a card that was soooooo much better in my head! LOL Do you ever do that? Have an absolutely clever card all mapped out in your brain, you stew on it and figure it all out and then it just doesn't happen the way you want it to? That is exactly what happened with this card, but I figure we grow from our failures! Maybe you can give me some suggestions on how to make it better? 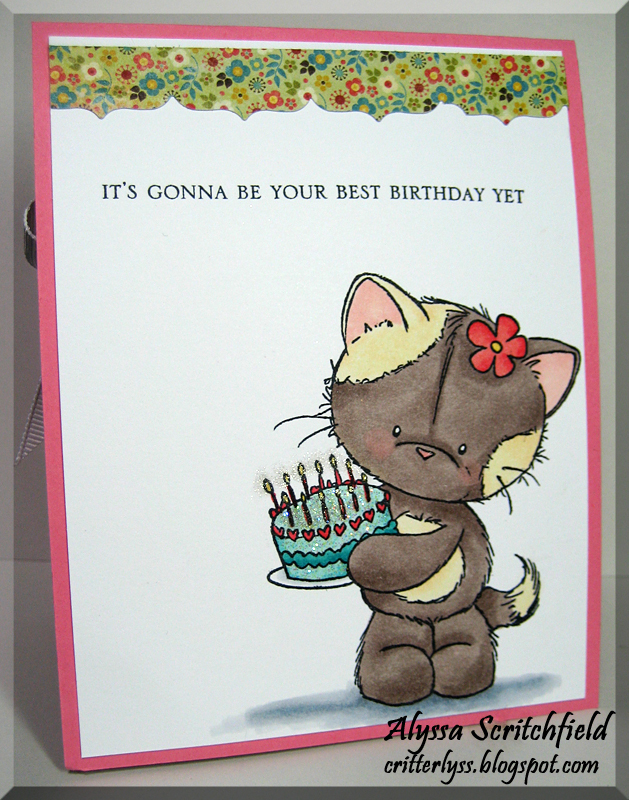 First off, here is the adorable little Kitty with Cake from Wild Rose Stamps. I don't have cats because I am wildly allergic to them, so I went with whatever colors I felt like playing with instead of leaning toward realistic colors. The browns are a cocoa combo - E71 & E74 while the creamier spots are a combo of E51 and YR30. YR30 is one of the new colors that was released this year and I just love it! It's soft and vanilla like - the perfect cream color. The cake is covered in stardust Stickles with more glitter spread around the candle flames. Here's where the card needs help. Instantly upon seeing this stamp, I thought it would be darling to only get a peek of the cake from the outside of the card. 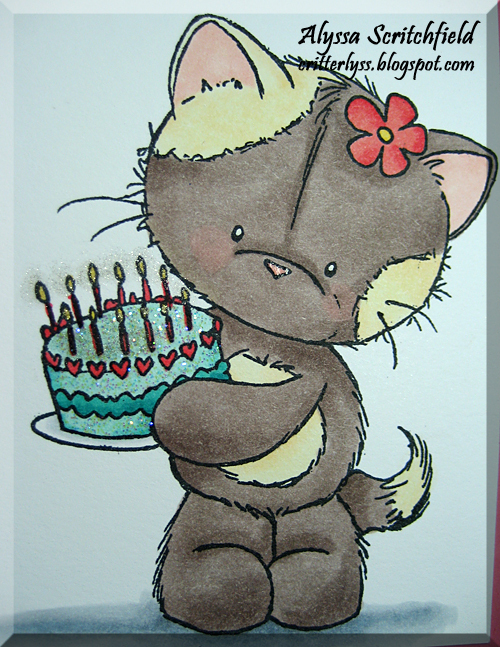 So little kitty is stamped and colored inside. Give me some suggestions on how to make this front work! And here is the inside of the card. It might just be paper choices that don't work for me, but I need help with this one because I still love the concept! I love the idea! I think maybe if you used less busy paper it would work better. As it is the cake kind of gets lost. It's a lovely card, and I like the concept too. You asked for some comment, well, me, I'd have punched a slightly bigger circle from the front, then framed it with another cut out circle frame, maybe just a fine lacy one or plain ring. It would highlight the viewing hole me thinks, for want of a better description. Hope you don't mind me giving my ideas. 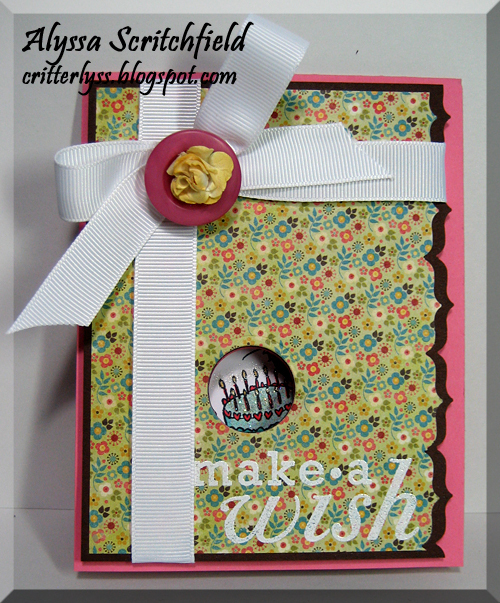 Still a great card and I like the patterned papers you've used. I think it does work and it does look great just the way it is though. Oh yes, and FABULOUS coloring!! Absolutely fab-u-lous coloring.